Henry's Jerk Tempeh Recipe great for a sandwich, wrap or beans and rice! This marinade and baked tempeh recipe is a truly healthy and delicious meal for everyone! Our Soy Kasha Tempeh is a perfect option for this wonderful vegan dish, adding a wonderful deep flavour from the organic whole buckwheat (gluten-free by the way!). We recommend this tempeh recipe in a wrap or a sandwich, or garnish with chopped cilantro and serve as a side with rice and beans. Alternatively, use one of our other flavours and see which you love the most! 3. (Optional) Steam or poach slices for 2-3 minutes. Remove from hot water and set aside. 4. In a food processor, blend together all the marinade ingredients. 5. Pour the marinade over the tempeh and stir gently to coat. 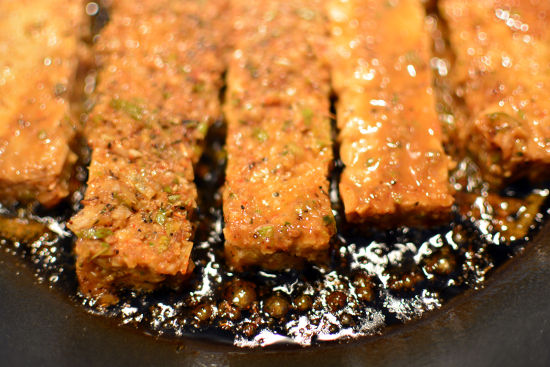 Allow tempeh to marinate for at least half an hour (You can also store marinated tempeh in the fridge for 2-3 days). 6. 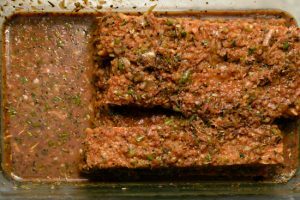 Pick the tempeh slices out of the marinade and put them on a lightly oiled baking sheet. Reserve marinade. 7. Bake for about 10 minutes. Flip the slices and baste with a bit of the marinade, making sure to reserve at least a few tbsps. 8. When tempeh is golden-brown, pour the rest of the marinade onto the tempeh. Allow to cook for another 2 minutes, and then remove from the oven. 9. Serve immediately. You can eat this tempeh in wraps or sandwiches, or garnish with chopped cilantro and serve as a side with rice and beans. We hope this vegan tempeh recipe turns out great for you! Don’t forget to try our Grilled Orange Ginger Tempeh as well!